Make it Right Challenge Entry Unveiled — time to vote! So, 2 weeks ago I gave you a teaser on what I made for the Make It Right Challenge sponsored by Art Gallery Fabrics. I was finally able to take some pictures on a recent visit to our beautiful Duke Gardens, and I am ready to share it with you. Drum roll please…. I thought long and hard about what I wanted to make for this challenge. I thought there would likely be a lot of quilts and bags, and I wanted to do something different and unexpected. Before this, it never crossed my mind to recover an umbrella; but out of the top 3 things I had on my list, that was the one that just seemed to stick in my mind. So I ordered the fabric and started looking for a frame. I found a cheap 60″ umbrella on a popular online electronic commerce website. (I definitely wouldn’t recommend what I bought for it — I had two shipped to me and they were both broken in one way or another. I had originally thought I might turn this into a pattern, but if I do that I would need to find a better quality umbrella frame.) And, on retrospect, maybe I should have gone with a slightly smaller version. 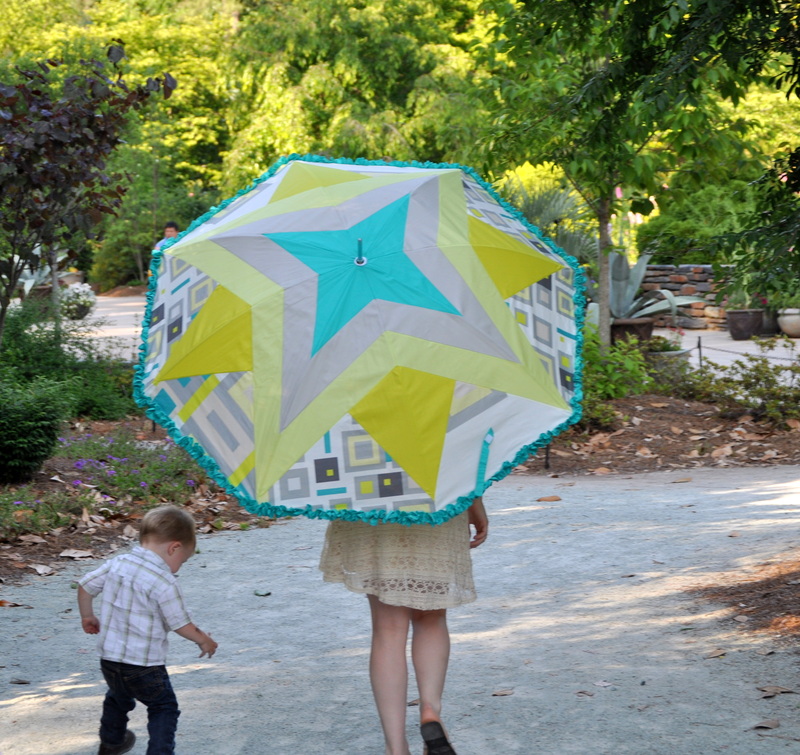 This 60″ wide umbrella is big enough for two! Once I had the pattern designed, it wasn’t very hard to piece it all together. It is pieced with Aurifil thread which stitched wonderfully. The only broken thread I had was when I was sewing with the ‘pedal to the metal’. Getting it on the frame though was a different story. Let’s just say there was a lot of trial and error, and several days of refitting. It has been treated with a waterproofing product, so although I took pictures on a sunny day (sunny days just work better for picture taking), it can be used in the rain. All entries are to be uploaded to AGF’s Pinterest board today. I can’t wait to see what everyone made. Voting is done by pinning and liking. Please do not pin from this site since it cannot be tracked. You actually have to pin from the Art Gallery Fabrics board on Pinterest. Go take a look and vote for your favorite (hint, hint). Here is a link to the challenge entries and mine is under “Make It Right – Apparel”. http://pinterest.com/artgalleryfab/make-it-right-apparel/. I still had about 10-days left until the deadline for submitting projects, so I thought I would just ‘throw together’ a baby quilt with the left over fabric and submit it as well. Honeyman laughed at me in thinking I could just ‘throw’ something together – I tend to lean more towards the complicated projects rather than simple ones. I thought it was possible, but I ended up getting sick for about 5-6 days and was not able to get it finished in time. But here is a sneak peak of it. Hopefully, I’ll have it finished in the next week. Although it won’t be finished in time to be submitted for the challenge, a finish is still something to be celebrated. This entry was posted in Quilting/Sewing and tagged agf, art, art gallery fabrics, aurifil, baby, challenge, fabric, gallery, piece, Pinterest, quilt, umbrella, vote, waterproof by monkeyneedle. Bookmark the permalink. I’m sorry I didn’t see this last week, but wow!! That is amazing!! Likewise, I never would have thought of recovering an umbrella frame, but now I’m wondering if I have one that could be repurposed! Whoop whoop!! 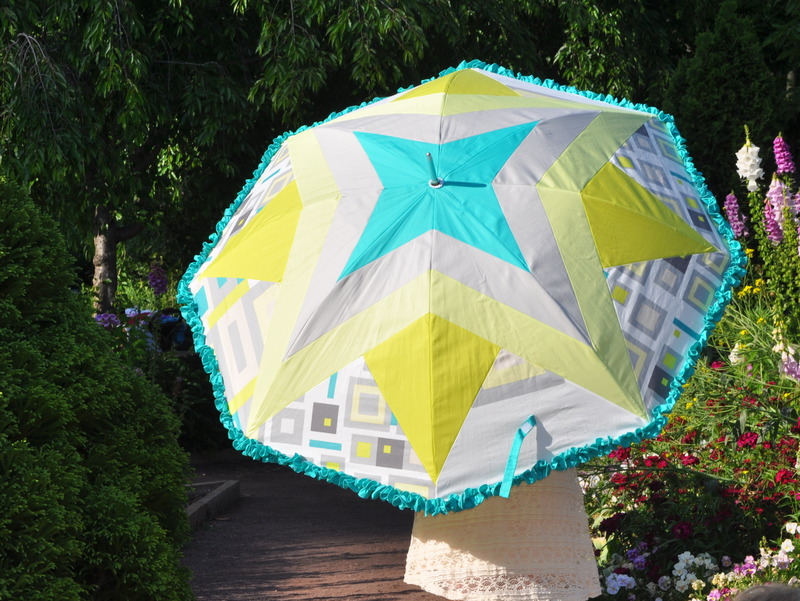 I went over and liked your project on Pinterest- the umbrella is amazing!! I love your umbrella! And yes, I did vote for it. 🙂 Well done! Thanks so much, and an extra thanks for the vote! I so love the umbrella – nice job. Great place to take photos as well – looks like you had a ton of fun. Thanks Michelle. Duke Gardens is a great place to take photos — it is just naturally beautiful. We had fun too — we took a picnic lunch. 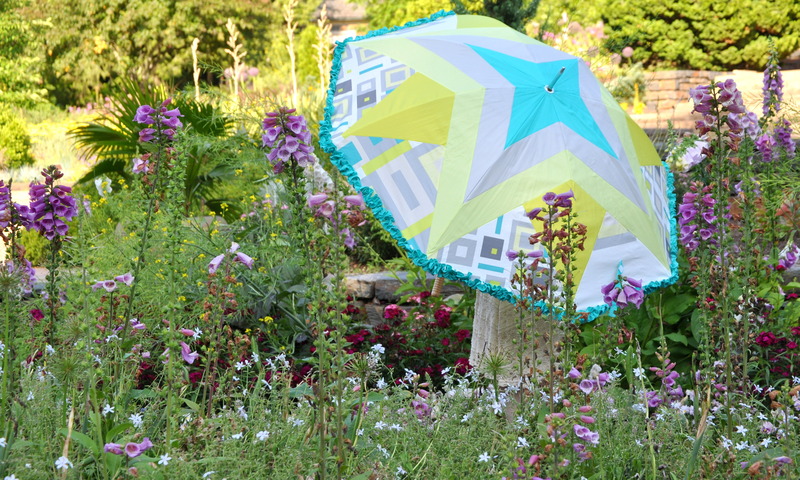 Your umbrella is totally amazing from the colors to the design. So unexpected. I like your perseverance. I will definately vote for you. Your quilt is wonderful also. Nancy, thanks so much for the sweet comments, and an extra thanks for the vote. Thanks for stopping by! love this quilt! great color scheme! Your umbrella is wonderfully creative! Best ever!!! Thanks so much! I’m in tears from all these sweet comments. Tickled pink to see your umbrella it is soo beautiful and the ruffles are so feminine! Did you use a pattern for the quilt you threw together? At first I thought it was a lot of pieces pieced together,but then I realized it was one print from Angela Walters line! Thanks Sara for the sweet comments. The quilt pattern is my own, although chevron patterns all tend to be somewhat similar – you really just vary the size of the strips and the angle you want to cut it on. The grey printed fabric was a panel from Angela Walters latest line — that was the whole point of the challenge. To use that fabric and any of AGF’s pure element solids to create a project using at least one yard of the panel. No other fabrics were allowed. This fabric is also in the umbrella. Um, what in the world?! You made an umbrella?! You are my new hero! I would have never even thought this was possible but I am amazed. The color, the pattern, the design, everything – awesome. 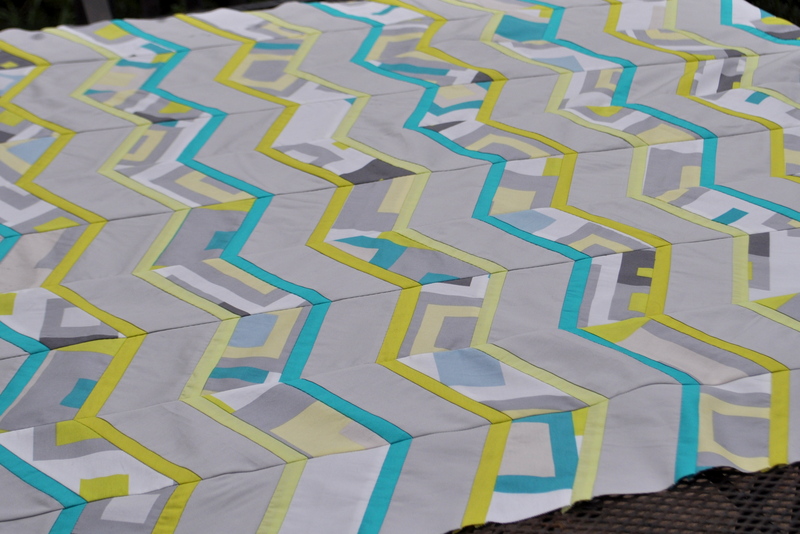 I love the baby quilt too – congrats on such an awesome and original creation! And, if you do make a pattern, consider me your first customer! Thanks Ashley. I wasn’t sure it was possible either, but I decided to give it a go. I’m very happy with how it turned out. I’ll keep looking for a better quality frame for the umbrella — or maybe at least determine if I can make a pattern to fit any 60″ umbrella. Maybe that is the way to go with this. Oh I love the umbrella idea! I’ve never heard of anyone doing that. You’ll get some attention for being unique, that’s for sure. And it’s lovely too.